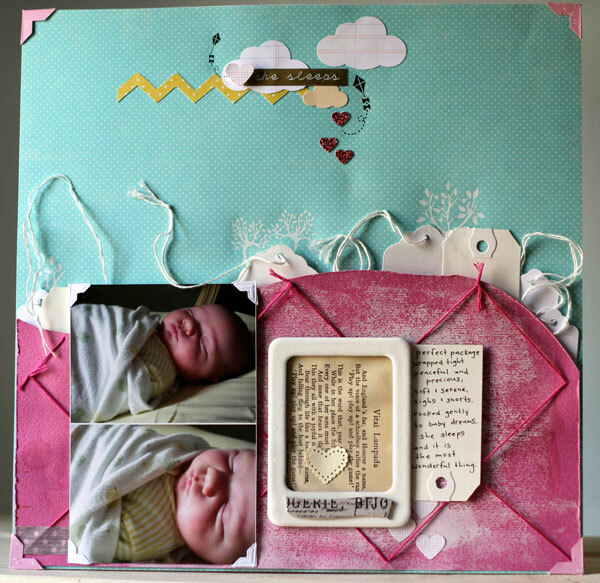 Lots of scraps and old stash were used for this page! I felt inspired to use some old stuff I had been saving after sorting through my large piles of scraps, and organizing all of my supplies. She sleeps, and what could be more lovely? The red stitched piece was a cast-off from several years ago that didn't make it onto the layout it had been originally made for. It was already painted and stitched, and I hated the idea of throwing it out. So glad I finally used it! 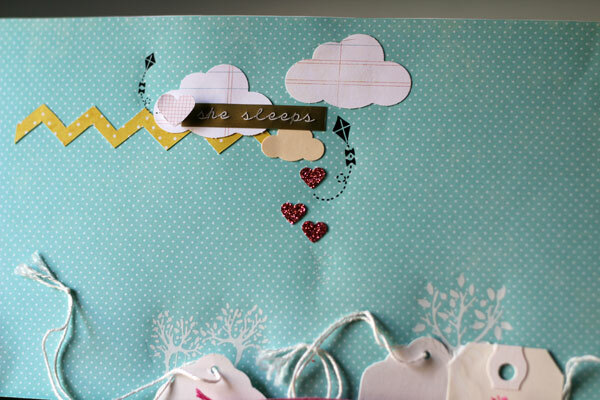 Other scraps include the photo corners, book page behind the frame, the cloud punchies, and the chevron paper piece. Items from my stash of 4+ years ago include the polaroid-inspired chipboard frame, and the white tree and black kite rub-ons. I always try to punch out shapes from any scrap pieces I have left over and keep them in small tart tins on my desk. 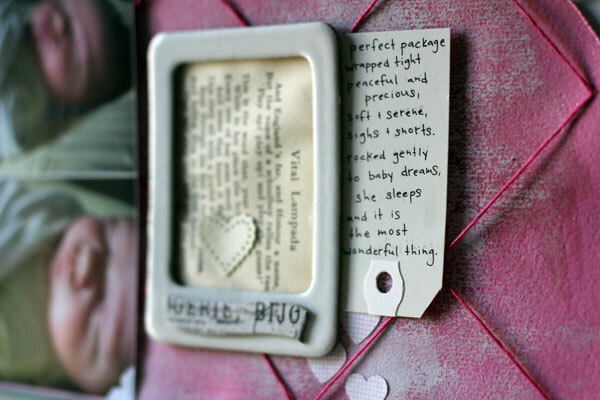 This is a great way to use up little pieces of left-over paper that feel too small to keep, but wasteful to discard. Plus, this way I always have a great assortment of punched shapes for a page, which makes finding something to add a fun touch or bit of colour way easy! 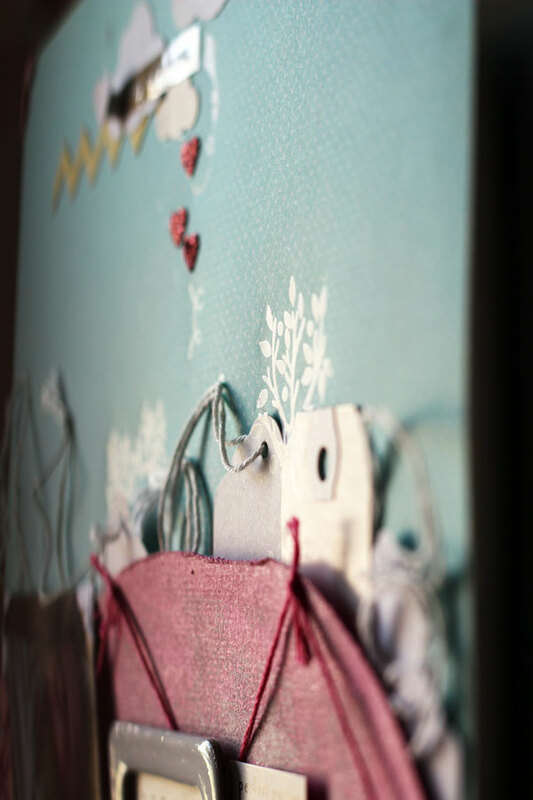 I painted the chipboard frame with glossy white paint and the Maya Road chipboard banner is covered with Tim Holtz tissue tape. But on a serious note, I DO like that that is 'your thing'...i.e. the repetition of similar items/products, because it gives your pages a cohesive, identifiable look to it. Loving your work, as always!